Polymer Clay Projects - The Creative side of your Doll House Hobby. Come Meet a Real Doll! 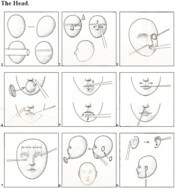 The following Project is taken from a book by Sue Heaser called "Making Miniature Dolls with Polymer". The project itself is titled: "Sculpting a Woman Doll"
However, based on a talent level between 1 and 10, we would put this particular project at level 8, with a talent level of intermediate. We are not at that level ourselves but we found this particular polymer clay project interesting enough we were willing to put what we think of our own talent level aside and risk getting involved regardless. So jump right in with us. Getting involved in the art of creation is the key. We are sure your results will be as good as others. On this website we do not particularly like overly long pages so this is the reason you will find this review info, including it's introduction, divided up into 3 consecutive pages. We thought it appropriate not to short change you, by letting you read what we considered an incomplete review. And, we have purposely provided you with all the encouragement needed, in our review, to complete a figure of your choice, with us. Work away at your own pace staying focused on this current polymer clay project and we will finish our dolls to share with the world, together. 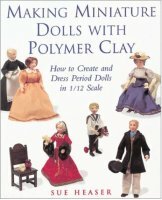 Our review of the Sculpting Section in "Making Miniature Dolls with Polymer" Starts Here. Part 2 of 3. This is a Great Book for your Polymer Clay Projects collection. From the techniques to the actual sculpting to assembling to painting to wig making, Sue once again encourages you just by reading to get started, NOW. She tells you that the process of making the face and hands of any figure is the most challenging. And, the tendency to make your dolls, when constructing them for the first time, look older, is a common result, as well. Worth noting also is that modeling compounds are great mediums for imitating things such as leather or fabric looks. It is a substance that will produce realistic looking footwear for example. While sculpting your figure do use the templates provided by Sue to gauge if your tiny person is measuring up to the pattern. That's where having a copy of the pattern pieces will help you keep your copy of "Making Miniature Dolls with Polymer" clean and reusable for years to come. The clays may tend to soil your book if you compare your size figure to the templates without providing yourself with adequate copies of the pattern pieces, at the very first, before you start your new polymer clay project. For our example, though, we will capitalize on the making of a Woman Figure. Making the woman's head consists of 10 easy to follow steps, as do the arms with 5 steps, the legs with 8 steps and the body with 6 steps. Sue begins and takes you through each part systematically. Telling you that you can do this mini creation thing. Like we said before, we hope her confidence finds us and makes this a reality. Or what can we say.... "oh you poor little doll." We shall pray for your entry into our world. As unglamorous as it could be. Scanning over the instructions we do see that she has plenty of pictures to help in our efforts of design. And where and how to press out our modeling compound is illustrated in detail. So maybe this won't be too complicated after all. But we do foresee plenty of measuring and calculating as we work along in this intriguing and definitely captivating project. One more thing we notice is that Sue provides both types of measurements for people. 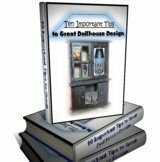 Seeing as she instructs both in the UK and US markets that is a great added feature of her manual on doll's house figure creation. And for Canadians too this is a help. We tend to use a bit of both types of measurements and do appreciate the old school as well as the new. Some of us grew up on standard measures and do feel comfortable with them. With the arms she works the measurements for the costumes into the works as well. And gives you a heads up about the costumes you may have chosen to display on your tiny person. Giving you something to aim for, we guess. And hopefully you have decided prior to starting this polymer clay project which costume you intent on making for your doll to wear. It pays to do ones homework before starting any project. The legs have the same detailed instructions about them, leading you up to designing the footwear. These boots are crafted onto the leg. Yes they have become fused to the lower limbs. So you will not be removing them. We suggest you aim at creating a boot complementary of different outfits. Just in case you wish to dress your figure differently from time to time. Like we said on the home page of our website this is a "childlike" hobby. And like children, we like dressing dolls. We actually do. So don't be ashamed if you do as well. Feel free to be a child right along with us. As we wrap up this section of our review we hope you will join us in trying out miniature people creation for yourself. We look forward to what or shall we say "who" you will design.